We are living in the golden age of dentistry. Dental implants have revolutionized treatment options for patients From replacing to a single tooth to an entire set of teeth dental implants provide can patients restorations thought unimaginable little more than a decade ago. However too much of a good thing can bring its own problems too. 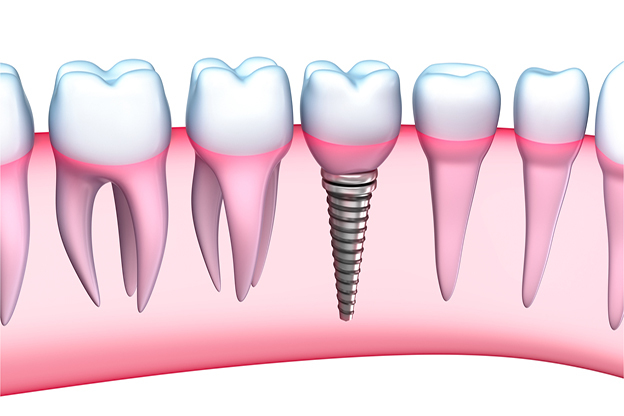 While dental implants are very predictable and long lived, they are not without their own issues. The most common problems associated with implants are with infection, bone loss and implant failure, not unlike natural teeth. Consequently it is important to carefully consider all your options prior to committing to implant treatment. This is particularly true if you still have have natural teeth that are planned for extraction and replacement. Below are several concerns you should investigate prior to committing to treatment. Often patients planned for implant treatment are having few if any symptoms. Teeth may be planned for extraction for many legitimate reasons. While on occasion these issues may not be evident to you, most of the time they are. If you have been told teeth need to be extracted to make way for implants yet you are unsure as to why this needs to be done, seek a second opinion. Is the area to be restored highly esthetic? Simply put, it can be very difficult to place an implant that is both functional and at the same time highly esthetic. This is due to the trauma of tooth removal and the gum tissue and bone loss that results. Often such esthetic areas are better treated with convention prosthetics such as a bridge. Bone loss does not mean necessarily natural teeth must be removed. Nature has been nice to us permitting the full function of most teeth even with loss of well over half of the bone support. For most patients a modest commitment to more frequent maintenance care and these compromised teeth can last for a decade or more delaying or avoiding the need for implant treatment. Please remember dental implants can experience bone loss as well due to the same reason as loss on natural teeth. Does the missing tooth/teeth need replacement? Although at first blush this may seems a somewhat silly question, it far more pertinent than many realize. Although we all want to maintain a full dentition for our entire life, bad things happen. Even if you manage to defeat decay and periodontal disease there are baseballs, hockey pucks, car accidents, falls and a myriad of other hazards that cause the loss of teeth. When the inevitable happens your first consideration should be ” do I need this replaced. While the answer to this question is fairly obvious for front teeth it may not be so for every back tooth. For example most second and third molars doe not provide much function or chewing efficiency. They are not seen in the Esthetic zone so often times their loss is easily accommodated. Immediately after these teeth are removed the patient notices the change. I always tell them to let me know how badly they are missing these teeth in 2-3 months. The vast majority of patients find they have no desire to replace these teeth. However, about one in ten find the change problematic and seek a restoration. This is not the case with first molars and teeth forward. It is here the bulk of your chewing efficiency comes from. These teeth are also seen in the esthetic zone so there are far more compelling reasons to replace these teeth. While tobacco use, or more accurately nicotine abuse, is not an absolute contraindication to implant placement it is a concern that must be weighed against other options. There is no question that on average the success of implant treatment among nicotine users is lower compared to non-users. How this plays out for a specific patient is variable. If you use nicotine, you should consider conventional restorations first as they stand the best chance of being successful in the long term. Consider implants only as a second option and understand you are potentially accepting more complications should you go down this path. Beginning in the 1990’s new drugs were introduced to help manage osteoporosis. These drugs were revolutionary. However again nobody considered what could happen if these agents did too good of a job. Unfortunately or some these powerful drugs can be too effective and create bone problems specifically in the jaw. If you have been on medications for osteoporosis for more than 5 years prior to placing dental implants it may be necessary to do some blood tests to see what the condition of you bone is. Sometimes it is necessary to discontinue these drugs for a few months to allow your bone to recover a more normal healing response before implants can be placed. Please note, untreated osteoporosis is also a risk when it comes to dental implants. Bone that is too hard or too soft is not a good thing. Getting your bone density just right should be the goal of your treatment. Then dental implants work well. The dental nerve tissue inside teeth is fragile. Every time there is damage to the tooth the nerve is damaged. If this damage happens repeatedly or if a single event is bad enough the nerve tissue can lose its blood supply and die. This dipoles not mean the tooth is “dead”. All the ligaments that attach the tooth to the bone are fine and remain functional. In such a situation a root canal is the treatment of choice. This involves cleaning out the inside of the tooth where the nerve tissue used to be and placing a filling to keep bacteria out. Caught and treated early root canal treated teeth can last as long or longer than dental implants. However if the tooth dies and then goes through several cycles of acute and chronic infections, success rates for root canal therapy drop. Interestingly implant success is lower in sites where repeated tooth infections have occurred as well underscoring the need to address such problems early on. Reasons to consider dental implants over conventional restorations. Some patients have far more problems with tooth decay than others. This is particularly true if you you are experiencing problems with dry mouth. Often this is a side effect of medications but can also be due to aging and disease processes. Whatever the cause decay activity increases in adults over 50. For patients experiencing problem with decay, as indicated by more than one decay lesion per year, Dental implants are a better choice over conventional tooth retained restorations. Simply put, titanium and ceramic do not experience decay as the natural teeth retaining crowns and bridges do. Restorations on teeth with severe bone loss. A tooth with bone loss, standing on its own, may function fine for many years. However, if that same tooth is employed to retain a large restoration, the excess load placed on this tooth may accelerate the bone loss leading to failure and loss of expensive dental work. In such situations dental implants may be used instead of conventional bridges to distribute the load of biting away from the compromised teeth. In some cases the natural teeth may be extracted and implants placed to optimize implant location making placement of a restoration easier and more predictable. If teeth are allowed to remain with longstanding root canal infections, success rates for root canal therapy drop significantly. While not an absolute contraindication for treatment, it is best to approach such teeth with a 2 step approach. First the nerve chamber is cleaned and a medication is placed. If after a few months the surrounding bone shows signs of healing the root canal procedure can be finished. If ther is little sign of healing or pain remains persistent then extraction and bridge/implant treatment is indicated. Many patients can not wear dentures. This can be due to anatomical problems or dentures can’t be tolerated due to instability, severe gagging or sensitivity to the materials used to make the denture. This is a problem implants were designed to solve. From providing an simple anchor to minimize movement to a full dentition permanent restoration that is fixed to the implants, many options exist that will make your denture more comfortable, functional or you can get away fro the concept of a removable denture altogether. The choice is yours. When it comes to these factors each patient is unique. How to choose what options are best in your case requires consultation to review all options including doing no treatment. If you are unsure how to proceed or believe you have other options that have not been fully explored, a second opinion is a good idea.